At one busy Starbucks at New York City’s Port Authority commuter transportation hub, there is a large chalkboard on the wall behind the hand-off area telling customers how to use mobile ordering, an app-based system that lets customers place orders on their smartphones and avoid the in-store line. A smaller printed sign placed on the hand-off counter tells customers already in the know to pick up their orders there. This is where over the course of 45 minutes during a weekday after-work rush, several people, almost all wearing headphones and seemingly in a hurry, head over to catch a barista’s attention and grab their orders before rushing off into the sea of commuters heading home. When asked to talk to Eater about why they use the app, all declined, with one woman apparently so bothered by the request she responded with a loud and vehement scold before marching away. It’s not surprising Starbucks Mobile Order and Payment users have little patience or desire for social interaction — that’s the point of the app, to help them avoid having to wait in line and hang around the store with the likes of teens, wifi moochers, and pesky reporters. But many are not so lucky. While insanely popular, it’s no secret Starbucks’ mobile ordering and payment app has caused many headache-inducing experiences for app users and in-store customers alike. The service is supposed to let customers skip in-store lines and simply walk in and pick up their orders. But in many busy locations, the increase in order volumes ultimately back up the line for in-store customers and cause confusion for the mobile coffee addicts who don’t have their drinks right away. Some potential shoppers would walk into stores, see the long queues and walk back out, execs admitted in January. But crappy mobile ordering experiences won’t fly — considering the chain has become a huge leader in the quick-service mobile app game. But McDonald’s, Dunkin Donuts, and pizza chains are close behind in app popularity, and as more fast-food and restaurant chains start adopting mobile ordering into their businesses, eyes are fixed on how the cafe franchise will remedy its app’s congestion problem. Starbucks thinks it has a solution. In its earnings call last week, CEO and president Kevin Johnson admitted that the old mobile order and payment process was hurting business, and announced how the company is trying to fix the issues. Their technical solution includes new “digital order managers” (DOMs), tablet-based systems that let baristas track and manage all incoming orders. But Starbucks reps did not specify with Eater how this system is different than the current one, only that the new system allows them to track data to improve workflow (The company would also not specify what kind of data would be collected.) What is new for users is that customers will start getting notifications through the app when their orders are in fact ready, instead of an estimate that may bring them into the line too early, making them wait. This comes about a month after Starbucks unveiled a new cashier-less design concept, centered completely around mobile users — another attempt to improve the smartphone ordering experience. The store, which debuted in Seattle, has a pick-up station for customers and no ordering line or seating. Johnson said the company is working on incorporating similar mobile ordering into designs of its future stores. Meanwhile, the store is also re-allocating labor during peak times to make filling orders less discombobulated. But is this enough to win back customers? Eden Gillott Bowe, crisis PR expert and president of Gillott Communications, thinks so. “Starbucks is one of those special brands that has such a cult following that I think there’s quite a bit more give and leeway that their customers give them,” Bowe said. New features like the app order ready alert systems will be the biggest help, she argued, because the core of these problems is communication. Fixes like that adjust the process enough so that customer “don’t just show up immediately thinking the red carpet has been rolled out for them simply because they ordered online,” she said. 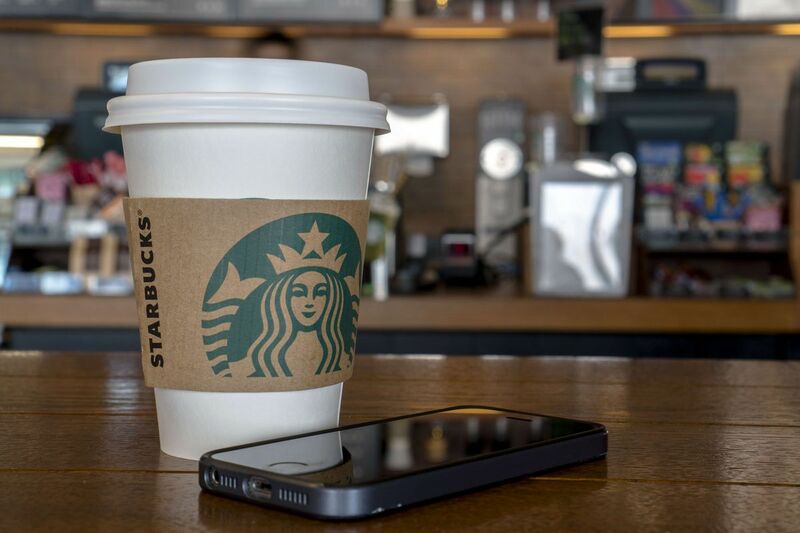 Despite its mobile ordering woes, the Starbucks app continues to grow in popularity. About 1,800 stores in the U.S. were seeing at least 20 percent of transactions handled through mobile devices, Starbucks said. The mobile ordering system accounted for 8 percent of transactions, while overall mobile payment (including in-store mobile payments) accounted for 29 percent of transactions. It seems Starbucks is banking on it to keep them alive in a technological world. Throughout the earnings call, Starbucks execs referred to the impending “disruption” of brick and mortar retail spaces, predicting more overlap between the two, hence a push for mobile ordering to work. Starbucks is testing the DOMs in select stores and has plans to release them in its highest volume stores in the next few months. Bowe believes this will keep loyal customers on board, because at the end of the day, despite issues customers are seeing in stores due to the app, their need for coffee outweighs the small pains.